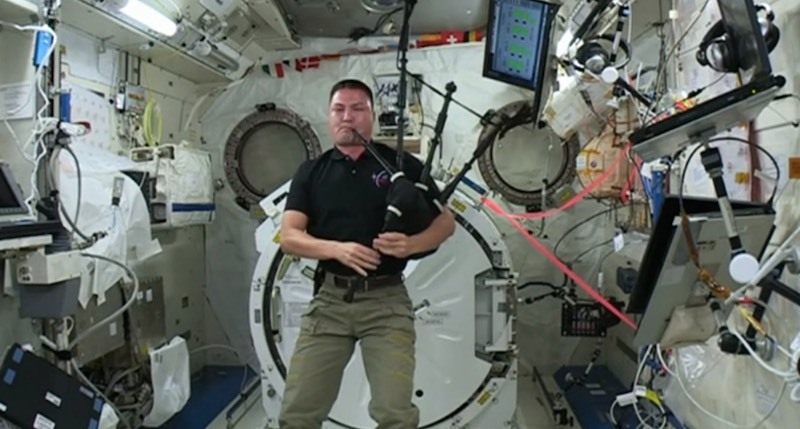 If it was your life dream to be the first to play bagpipes in space – sorry, Kjell Lindgren is the first to gain that accolade as he played “Amazing Grace”, on board the International Space Station, as a tribute to a colleague. The bagpipes were made by McCallum Bagpipes, based in Kilmarnock, Scotland. Kenny MacLeod, the proprietor was delighted that his pipes became the first to be played in space. Kenny Macleod told BBC Scotland the 42-year-old astronaut had got in touch two years ago to say he was going to the space station and wanted to play the pipes while he was there. Lindgren hails from the Midwest, but spent most of his childhood in England. He is a graduate of the U.S. Air Force Academy, in Colorado Springs, and Colorado State University, in Fort Collins. Lindgren received his medical degree from the University of Colorado and began working as a flight surgeon at NASA’s Johnson Space Center, Houston, in 2007 before being selected as an astronaut in 2009. There are six astronauts currently in space on the 45th expedition to the International Space Centre. In a video recorded in the last few days, Mr Lindgren said all of them had come into contact with Dr Hurst during their training and were “shocked and saddened” to hear about his death. Dr Hurst worked for US engineering company Wyle Science as a research scientist and instructor.